SAN FRANCISCO — These days, the price of a San Francisco home can easily top a million dollars. But one savvy investor has bought up a whole street in the city's most exclusive neighborhood for a mere $90,000. Trouble is, some of the extremely wealthy residents of Presidio Terrace were not aware their street was up for sale and are not pleased it has been sold. Presidio Terrace is an oval shaped street sealed off by a gate from the tony Presidio Heights neighborhood. Lined with towering palm trees and multimillion dollar mansions, the street has been home, over the years, to famous residents including Sen. Dianne Feinstein and House Democratic leader Nancy Pelosi. Thanks to a city auction stemming from an unpaid tax bill, Bay Area real estate investor Michael Cheng, and his wife Tina Lam, bought the street and now own the sidewalks, the street itself and other areas of "common ground" in the private development that, the San Francisco Chronicle reported, has been managed by the homeowners association since at least 1905. Cheng says reaction to the sale has been less than neighborly. "I thought they would reach out to us and invite us in as new neighbors," Cheng told The Associated Press. "This has certainly blown up a lot more than we expected." It turns out the homeowners association for Presidio Terrace failed to pay a $14-a-year property tax, something that owners of all 181 private streets in San Francisco must do, the Chronicle reported. A construction workers stands in front of a gate leading into the Presidio Terrace neighborhood Monday, Aug. 7, 2017, in San Francisco. Thanks to a city auction stemming from an unpaid tax bill, a Bay Area real state investor bought the street in the neighborhood and now owns the sidewalks, the street itself and other areas of "common ground" in the private development that, the San Francisco Chronicle reports, has been managed by the homeowners association since at least 1905. So the city's tax office put the property up for sale at the cost of $994 in an online auction to regain unpaid back taxes, penalties and interest. The couple eventually won the street with a $90,100 bid in an April 2015 auction. 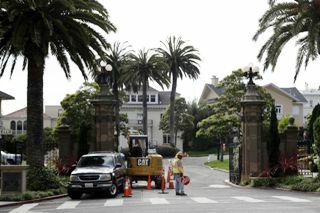 Scott Emblidge, the attorney for the Presidio Homeowners Association, said in a letter to the city that the owners failed to pay because the tax bill was mistakenly being sent to the address of an accountant who hadn't worked for the homeowners association since the 1980s, the Chronicle reported. Emblidge said the residents didn't know their street was put on the auction block, let alone sold, until May when a title search company hired by Cheng and Lam reached out to ask if any residents had interest in buying back the property. That was one of several options Cheng and Lam have considered for making the investment pay off. Another option is to charge residents to park on their street — and rent out the 120 parking spaces that line the grand circular road. "As legal owners of this property, we have a lot of options," Cheng said, adding that nothing has been decided. The matter could be headed for court. Last month, the homeowners petitioned the Board of Supervisors for a hearing to rescind the tax sale. The board has scheduled a hearing for October. The homeowners association has also sued the couple and the city, seeking to block Cheng and Lam from selling the street to anyone while the city appeal is pending.